Christmas is a wonderful time of the year, but it needn't be chintzy. 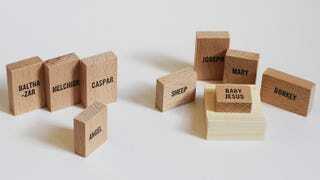 This sleek nativity set, for instance, brings some simple good design to the festive period. "The characters have lost their features and colours for a modern appearance that could appeal to both believers and atheists... The holy scene that has been broadly reproduced is here recognisable by the names only, giving free rein to people's imagination."